Say fur-well to stinky pets. Our best-in-show ear cleaner and the best shampoo from head to tail are safe, gentle and effective solutions for dogs and cats. They're the quickest and easiest way to care for your pets, clean their itchy, irritated ears; help remove wax buildup, dirt and mites; and shine up their beautiful coats, leaving them fresh and clean. Oxyfresh Pet Shampoo is definitely Best In Show. We designed our pH balanced formula to support and soothe pets' delicate skin and ears. We use only safe and gentle ingredients without harsh fragrances to give pets shiny, fresh and beautifully conditioned coats, plus our citrus peel essential oil is a natural safeguard against fleas and ticks. 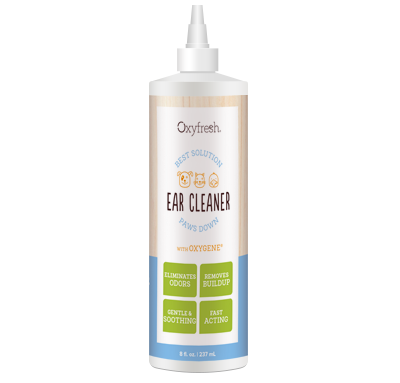 Cleaning pets’ ears is no longer a chore, thanks to Oxyfresh Ear Cleaner. It’s easy peasy with no rinsing required. Our fast-acting Ear Cleaner is loved by veterinarians and groomers alike. Unlike other brands, it’s fragrance and alcohol-free for those sensitive and delicate ears. IT WORKS - Our Pet Ear Cleaner is the best solution to help remove wax buildup, dirt and mites. Never stings, burns or irritates. ITCH RELIEF - Total care for raw, itchy and smelly dog and cat ears that will have them grinning ear to ear. SOOTHES EAR INFECTIONS - These can be dangerous. Our ear cleaner helps reduce bacterial growth and soothe sensitive pet ears. SOLVES TOUGHEST ODORS - The proprietary, gentle formula in our Pet Shampoo is unrivaled in neutralizing pet odors, including pesky skunk odor. SOOTHES SKIN - Advanced conditioning formula will make the pet feel truly pampered. Free of any harsh chemicals and fragrances that may irritate delicate skin. SHINIER COAT - Tough on dirt, but not on their coat. Formulated with essential oil and amino acids for an easy-to-brush coat that feels fresh and soft. HELP DETER FLEAS & TICKS - Our light citrus peel essential oil naturally safeguards pets against fleas and ticks. ALCOHOL FREE - Protect from itch or irritation that pets can get from other leading brands. NON-IRRITATING - Pets love it because it soothes and doesn't sting. NON TOXIC - No harsh chemicals. We use only the best non-toxic ingredients that are safe for happy pets and a happy planet. MADE IN THE USA - Our pet products are made here and gives our pet parents the peace of mind that they are safe for dogs, cats and other pets. Some might say it’s “one ingredient to rule them all.” We just think it’s great science. Why cover up dog and cat odors when we can safely neutralize them? Introducing our unique and exclusive Oxygene®: a brilliant, safe-for-all-pets, non-toxic ingredient that neutralizes odors on a molecular level. It not only effectively eliminates smelly ears, it helps remove wax buildup, dirt and mites, and never stings, burns or irritates. This safe, non-toxic formula is the first line of defense against ear infections. Help keep dog and cat ears fresh, and keep them happy and healthy with our innovative pet care products. This safe, non-toxic and pH balanced Pet Shampoo formula is the first line of defense against skin irritations and smelly pets. Help keep everything fresh and clean with our innovative pet care products. It’s easy peasy with no rinsing. Just add 10–15 drops into each ear. Massage the ears at the base. Let the pet shake its head and then gently wipe away the debris. Repeat if needed. A little goes a long way. Just apply a small amount to the coat and work into a lather. Let it soak on skin and hair for 2–5 minutes. Rinse well and repeat if needed. This USA-made formula contains gentle, safe and effective ingredients to give your pet a shiny, fresh-smelling, "best in show" kind of coat. No alcohol means no itch or irritation like you get from store brands. Got a cuddlebug? 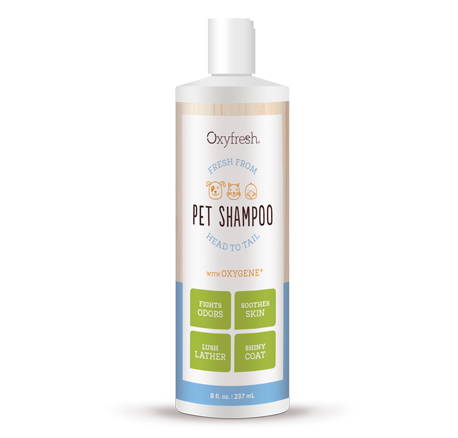 Oxyfresh Pet Shampoo is formulated with our exclusive odor-fighting ingredient, Oxygene®. It doesn't just mask odors ... it eliminates them completely. No more stinky pet ears! This safe, gentle ear cleaner makes it a walk in the park to get rid of your pet's wax buildup, dirt and mites. The result? Clean, fresh smelling ears you and your pet will love. Did you know? Keeping your dog's ears clean is the best way to avoid painful ear infections. Ear infections are the most common health issue in dogs ... yet many owners are unaware that their pets are suffering. And cats get ear infections too! Love using your products. I feel very fortunate to have found good products for my dog. Your customer service people are outstanding. Thank you.